Enhanced photo of an alleged Martian Colonist. Clow UFO officials are investigating eyewitness reports of a Martian colonist attending last Saturday’s Occupy Chicago protest. “If these photos, videos, and eyewitness accounts are accurate, an inadequately disguised Martian participated in a questionable public rally.” Said Paul Lang of Bolingbrook’s Department of Interstellar Affairs. 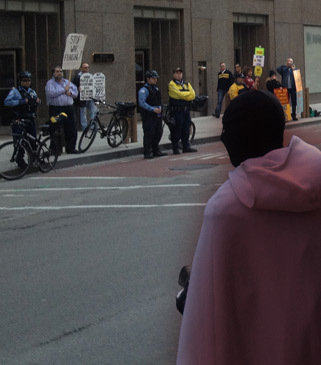 Photos, enhanced by The Babbler, suggest that a hooded figure at the protest had an inhuman aura. Assuming the filter works, the wind didn’t shake the camera, and the conditions were ideal, the aura belongs to a Martian colonist. Some eyewitnesses also believe the figure was not human. Susan Z. Parker, a member of the South Side True Socialist Party of Chicago Reformed, also had a conversation with the figure. Conservative activists, who follow local alien activities, denounced the colonist. Bruce N. Proctor, an Interstellar expert for the National Lawyers Guild, said the presence of a Martian colonist does not mean Occupy Chicago is under alien control. Lang said that Clow officials will remind that the residents aliens that they should support or oppose human protests from behind the scenes. Occupy protests are considered “Red Class” events that should be avoided. The Martian colonial ambassador could not be reached for comment. I think it's remarkable that you left out the most glaring possibility of the identity of the supposed "alien". Obviously it's none other than Garth! The hoodie is meant to hide his true identity. And this realization begs the question, who let him out of Aurora, in fact, who let Aurora out of Aurora? We in Montana need to know the answers to these pressing queries if we want to keep the "off-world" aliens out of Montana, such known critters as Rom Emanuel, who we all know is an off-world reptilian from the planet Homophobia Minor (located in the vicinity of Betelgeuse).